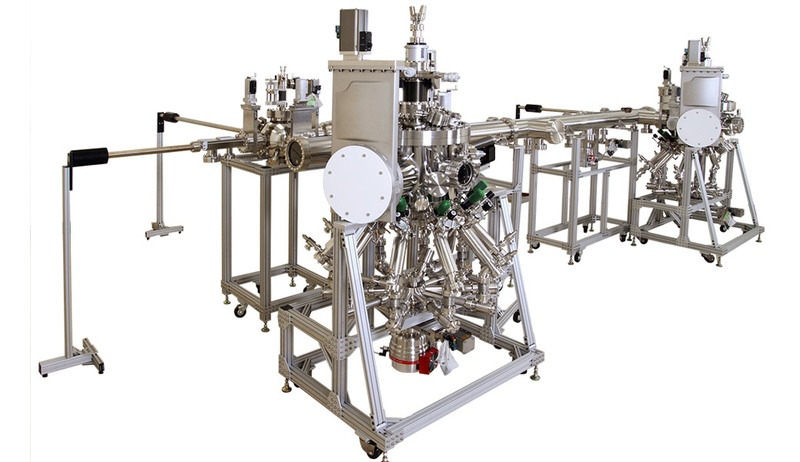 This multi-chamber custom designed system was fabricated for Argonne National Laboratory. It has two main MBE chambers and a sample preparation chamber, accessed through a loadlock. The system is designed to handle 2" wafers. The prep chamber is used for oxidation and annealing processes. The sample can then be transferred via a UHV trolley to two oxide-MBE systems with multiple effusion cells that can be used for growing multi-layers of oxide materials. The trolley was made long enough to allow for the addition of a third MBE system in the future. Unique composite materials can be produced in either or both MBE systems.